The “spin” is that Harley-Davidson reached a settlement with the U.S. Environmental Protection Agency (EPA) regarding the sale of its Pro Super Tuner — an aftermarket tuning product used to calibrate motorcycles intended for off-road and closed-course competition. The 411 is: Harley-Davidson agreed to no longer sell its competition-only tuner in the U.S. They also agreed to pay a $12 million civil penalty and spend $3 million on an air pollution mitigation project. In addition, Harley-Davidson will also have to buy back and destroy the roughly 340,000 “illegal” devices that it sold. As part of the mitigation of air pollution under the settlement, the motor company agreed to work with an independent third party to replace conventional wood-stoves with cleaner-burning stoves in designated communities, thereby improving future air quality. Important to note is that the settlement is not an admission of liability by Harley-Davidson. The EPA took legal action and alleged that by selling the Harley-Davidson Pro Super Tuner through its U.S. dealer network, the motor company enabled dealers and customers to tamper with motorcycles used on public roads. Harley-Davidson disagreed with the EPA’s position, noting that the tuner was designed and sold as an after-market, competition-only product used to adapt engine parameters for use with Harley-Davidson after-market equipment. The product was sold for more than two decades, under an accepted regulatory approach that permitted the sale of competition-only parts. Is this government overreach or the administrations regulatory process/approach to public protection in the race/competition-only arena? To settle or not to settle a case often comes down to a corporation’s litigation culture. Harley-Davidson likely determined that legal fees and the possibility of liability/payouts at the end of a losing legal battle meant it was more cost effective to capitulate, remove the product for sale — settle for $15 million and move on. Harley-Davidson, is one of many suppliers in the aftermarket race/performance parts industry and the legal tactics of the EPA, along with the potential consequences of prolonged legal action with manufactures will have a chilling effect on the performance parts market. It should be noted that Harley-Davidson’s corporate stance is and has been committed to meeting or exceeding all emissions requirements for its motorcycles in every market it serves. They have always included clear product labeling of competition-only products and detail on what performance enhancements are considered street legal and for competition-use only, and called out the legal consequences of tampering with emission controls and components, and what enhancements would void the vehicle warranty. 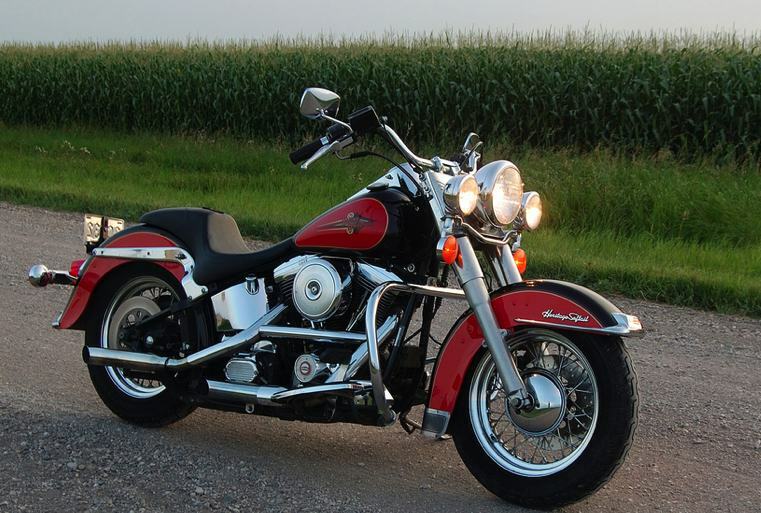 As a motorcycle enthusiast you’ve likely changed or upgraded the mufflers on that stock Harley-Davidson. Maybe even gone so far as to push it up a notch with a full exhaust upgrade, race tuner, cam and dyno tuning to live’n up the motor and eek out a few more ponies. And wink, wink, nod, nod, I’m sure that EPA certified “cat” remained on the bike to reduce tailpipe emissions, right? We all know that exhaust mods are a fine line in the environmental sand, yet most motorcycle enthusiasts if ask would state that they un-equivalently have a great appreciation for nature and their experiences with it on the open road. Maybe even consider themselves “Green.” I’m not talking about a raging tree-hugger environmentalist or “Hybrid Head” here, but someone who indeed cares about the environment and wants to do their stewardship part. And by riding a fuel efficient motorcycle it qualifies to a degree to speak with some green conviction vs. the guzzler tax crowd. Could we do more? Sure. So, let’s talk about the environmental footprint of your favorite refreshment after a long day of riding the Harley-Davidson. Whether it’s a beverage served on the rocks in a comfy biker bar or at home in a frosted mug or sipped from a flask with riding buddies around a campfire. The production of whiskey and other spirits requires much more energy than wine or beer. In addition, the distilling process also makes a lot of waste. Whiskey: Single malt Scotch is made from only one grain source, while most American whiskeys are made from mixtures of rye, corn, wheat, or barley. So what’s the greenest? Most single malts are produced by boutique outfits using old-fashioned energy-hogging pot stills, as opposed to the more efficient column-style stills employed by major distillers. And while American bourbons are aged in virgin-oak barrels that are used only once, most of those barrels end up being reused by other liquor makers. Green Suggestion: Maker’s Mark. The bourbon maker buys local grain and turns its waste into energy. Most of the company’s land is a nature preserve. Vodka and Gin: Although some vodkas are still made from potatoes, most now come from a mix of grains. Ditto for gin. In terms of distillation, vodka requires more energy and water than most spirits. That’s because it’s distilled down to 95 percent ethanol—some ethanol plants even make vodka on the side—then diluted back to 40 percent. Gins are often made the same way. Green Suggestion: Square One vodka, which is organic and purchases one-quarter of its electricity from a local wind farm through renewable energy credits. TRU2 gin uses lightweight bottles and recyclable corks, and plants a tree for each bottle it sells. Rum: The mojito enabler is made from molasses or cane juice, and its fibrous leftovers can throw off the microorganism balance in waterways. In 2001, the EPA sued Bacardi for illegally dumping 3,000 gallons of this goop into a river near its Puerto Rico plant. (Many major distillers now treat their water.) Sugarcane is also a notoriously destructive crop, producing massive amounts of wastewater and greenhouse gases. Green Suggestion: Don Qrum. The Puerto Rico-based distiller turns its waste into compost and irrigation water, and uses excess steam from its treatment plant to help power the still. Tequila: Tequila’s waste problem is as bad as rum’s. For every liter of tequila, you get about 11 pounds of pulp and 10 liters of vinazas, or acidic waste—which ends up befouling soil and water in Mexico’s Jalisco state, where most tequila comes from. Blue agave farmers, meanwhile, have used more and more pesticides since their crops were chewed up by insects during the 1990’s. Green Suggestion: Casa Noble or 4 Copas, the first tequilas to be certified organic. Beer: In 2008, New Belgium Brewing Company commissioned an environmental analysis (PDF) of its Fat Tire Amber Ale and found that refrigeration accounted for almost one-third of its overall greenhouse-gas emissions. Glass production was second, contributing 22 percent. Though aluminum production is an environmental disaster, cans beat bottles handily on the carbon front: Pablo Päster, a blogger and sustainability consultant, calculates that shipping cans rather than bottles results in 30 percent fewer emissions. And cans are recycled at significantly higher rates. Good news for your inner frat boy: Kegs are the most efficient vessels of all. Green Suggestion: New Belgium. The Colorado-based company brews in superefficient kettles and is entirely powered by renewables. Of course none of this is relevant unless taking into account greenhouse gas emissions and the water footprint to manufacture the product. So, to be fair it takes about 20 gallons of water to make a pint of beer and as much as 132 gallons of water to make a 2-liter bottle of soda. There you have it. A green guide to refreshments for your next motorcycle road trip. 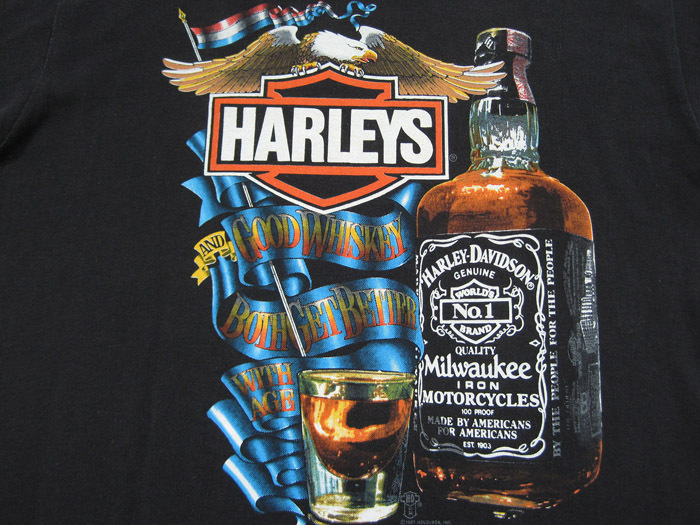 Photo courtesy of eBay, H-D and Jack Daniels (’80’s vintage t-shirt). Full Disclosure: Author has no affiliation with any of the above listed spirits manufactures. Don’t drink and ride. We’re less than a week into the NFL lockout where billionaires are arguing with millionaires about compensation and now there’s whining reports from players who say they can’t afford health insurance premiums. Normally, teams pay for that but during a work stoppage each player is responsible for their own coverage. And under the federal COBRA law it allows employees to continue coverage at their own expense where the average monthly fee for a family policy is about $2400. So we have a group of players whose average salary is approaching $2M and where a minimum rookie salary was $320K last season… is “worried” they can’t pay COBRA over a long term?! This is utterly preposterous. Many of us are worried about paying for the next tank of gas so welcome to the real world NFL players! And speaking of fuel prices, are you ready to pull out larger bills from your wallet for even higher prices due to the imminent delivery of boutique fuel called E15? 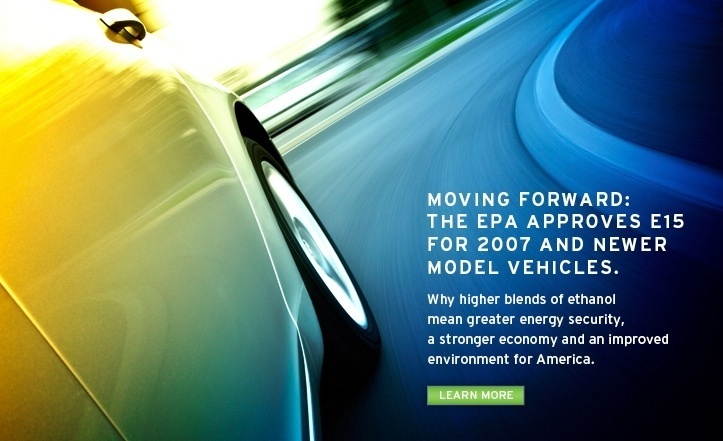 Here’s the background: Growth Energy, an ethanol industry trade group, petitioned the EPA in March 2009 to raise the limit on ethanol in gasoline from 10 to 15 percent. Several engine product and auto manufacturers as well as others urged EPA to be deliberative in its review process, and do adequate testing to assure that E15 would not harm existing products or pose safety risks. Despite the fact that E-15 blends were proven to cause engine failures from overheating as well as emission increases and emission (durability) impacts and material compatibility issues, in October, 2010, the EPA approve higher levels of ethanol (E-15 or 15% ethanol) in gasoline for use in only 2007 and newer automobiles. It seems that scientific facts were ignored. Not the first time the EPA has ignored facts. Remember the Uniroyal/Alar truth? At any rate, motorcycles are exempt from E15 use, but there is significant risk that consumers will unknowingly or mistakenly put E15 in motorcycles (“misfueling”). Since we’re all smart and would never knowingly misfuel our precious ride, the more likely case is where fuel retailers are not prepared to offer both E10 and E15 at their stations, and given the choice, will likely opt to offer E15 only. I don’t know about you, but in my motorcycle travels across Canada and the western U.S., there were many stations ill equipped to accommodate an additional fuel. This would then lead any business to choose between E15 and E10 fuels – and E15 will win out since it’s more profitable for them to carry for automobiles and motorcyclists will have no choice but to fuel with E15 and suffer the mechanical consequences. You might think the EPAs got your global warming back, but the agencies prior experience with fuel transitions isn’t stellar. In 1974, as the EPA led the transition to unleaded fuels, the Agency reported a misfueling rate of 15 percent over ten years after the introduction of unleaded gasoline. We’ve all seen the reports of station attendants fueling diesel in non-diesel automobiles which resulted in huge expense so it happens. It turns out the Outdoor Power Equipment Institute (OPEI) has recently filed an E-15 Partial Waiver Legal Challenge to request that the EPA, consistent with prior precedent, ensure continued consumer choice by requiring the continued sale of gasoline blends of no greater than E10 fuel. Clearly the potential of reduced volume of E10 fuel in the marketplace will likely result in the elimination of supply, and/or increase the price of what little there is available for motorcycle fueling. Photo courtesy of Growth Energy. No, I’m not afraid to put that in the title. It’s just if I do, this finely crafted missive is unlikely to pass the blog filters. In fact, those of you working at companies probably won’t see it pass through your company filter now that I’ve spelled out the word. Because that’s how afraid of plain English this country is. And if you’re protected from reality, how can you know the truth. What kind of crazy world do we live when environmental and industry groups who frequently oppose each other, AGREE to jointly ask Congress for thorough and objective scientific testing before allowing an increase in the amount of ethanol in gasoline? The ethanol industry, primarily lead by the Growth Energy trade group has been pushing hard to allow the amount of ethanol in gasoline to increase by 50%. It’s called E15 and some 36 groups have signed a letter that went to the majority and minority leaders of the U.S. Senate urging opposition to any amendment to the coming energy bill that would authorize the sale of gasoline with more than 10% ethanol. But, today the contrite attitude of the Obama administration granted the request of ethanol producers and will permit higher concentrations of the corn-based fuel additive in gasoline for vehicles made in 2007 and later. The EPA announced its “rubber stamp” decision just minutes later on how they will allow refiners to blend as much as 15%. The fact is that the Obama administration doesn’t have the power to order use of E15, however, the decision will have profound impact to motorcyclists. Automotive manufacturers (GM, Ford, Chrysler) have all expressed major concerns and believe ethanol concentrations of higher blends can damage exhaust systems, engines, fuel pumps and destroy catalytic convertors. By-the-way, this decision excludes ALL MOTORCYCLES, marine engines and non-road engines such as snowmobiles. Who wins with this “boosted” blend ratio? Well let’s follow the money… Corn-ethanol lobby groups like Growth Energy (headed up by Wesley Clark) will benefit. The U.S. pays a $0.45-cent tax credit to gasoline refiners that make a blend of as much as 10% ethanol. They win. Farm exports will increase and they win. Poet LLC, based in Sioux Falls, SD is the largest U.S. ethanol producer followed by Archer Daniels Midland Co. They win. In fact, the annual market value for ethanol in the U.S. has risen to $27.1 Billion since federal support began under the Jimmy Carter administration. Who loses? Consumers. Corn prices, cost of food, cost of fuel and cost of maintenance or repairs. And then there is the ever present mis-fueling issue. Lastly, how long until measures are put in place for motorcycles? Recently California Governor Arnold Schwarzenegger, signed SB 435 into law (without comment). Sure, I’ve got an opinion. I’ve got thoughts, but I decided not to write anything at the time because I just wasn’t in the correct mood. Content is important, but feel is key. How do the words flow together, I’m I overly biased, is the reader gripped? All good questions, but back to the main point… SB 435 requires all street motorcycles built after 2012 to have EPA-labeled exhausts and includes rising penalties for noncompliance. Interestingly is that ABATE took a neutral position on this bill. Isn’t this how it always happens. You’re having a grand old time, enjoying the moment and then someone announces their child peed in the shallow end of the pool as you watch everyone exit the water and wonder about the level of chlorination. The fact is that laws which regulate the motorcycle aftermarket have been in place for many years and specifically on aftermarket exhausts, the Feds mandate (in the Code of Federal Regulations Part 86, Subparts E and F) that new on-road motorcycles are required to meet limits on specific chemical emissions and that all motorcycles built after 1985 meet a stationary noise limit of 80dB. Furthermore, under Section 203 of the Clean Air Act, it is illegal for any person to remove or bypass (“tamper” with) any piece of equipment that helps a vehicle meet the above standards. To eliminate confusion, manufacturers are required to use matching standardized labels on both the frame and exhaust of any motorcycle to meet these requirements. It’s true that the aftermarket exhaust manufacturers are quite adept at including detailed disclaimers with their products as being “closed-course-only” use and clearly stating that installation would violate federal law. But, I’m not aware of any dealer in the northwest who has discontinued selling and/or installing aftermarket performance exhaust/parts. It seems there is this entire segment of the motorcycle industry operating in a gray area of the law that now have their days numbered. Harley-Davidson 2012 models will launch in 10 months (August 2011) and this new law does not bode well for riders across the country. Why? Historically, California emissions laws developed by the California Air Resources Board tend to become federal law (for example: EPA New Emissions Standards). Laughing photo courtesy of Mr. Schwazenegger. Over the weekend a riding buddy had a dealer remove the stock exhaust system and along with some engine work he upgraded the bike to a Vance & Hines Pro Pipe 2-into-1 performance exhaust. The Pro Pipe includes tuned length stepped headers with a highly efficient merge collector that feeds into the stepped megaphone design. The new Pro Pipe is not a mellow sounding exhaust and although I didn’t measure the DBA’s, it likely pushes the limits on noise-emissions when you roll on the throttle. The exhaust has no catalytic converter and missing from the new chrome are U.S. Environmental Protection Agency labels/stamps. Speaking of the EPA… On Monday the California Senate passed SB 435 by a vote of 21-16 and it’s now on Governor Arnold Schwarzenegger’s desk. The bill makes it a crime to operate a motorcycle manufactured after Jan. 1, 2013, that fails to meet federal noise-emission control standards. Motorcyclists whose vehicles lack the proper U.S. Environmental Protection Agency label would be subject to a fine. It’s not clear that this bill will do much to address excessive sound or reduce emissions, but it seems to unfairly target motorcycle owners. For example, it’s not practical in a real world traffic stop situation to locate the federal label due to the inconsistent location of the lable and in turn may well result in unwarranted citations. In addition, after-market exhaust systems (which are not always louder than stock systems) can be installed for a variety of legitimate reasons. A stock exhaust can wear out over time, be damaged, unavailable or prohibitively expensive. Motorcyclists would be forced to purchase Original Equipment Manufacturer (OEM) parts, while automobile drivers will continue to be allowed to install exhaust components from non-OEM sources. And what happens if you don’t live in CA and are considering a ride to the State. Or maybe you’ll be passing through a small part of the state on the way to Reno Street Vibrations 2013. Will you be unable to ride your motorcycle there because of this law or worry about being unfairly ticketed? It’s important to note that the state of California often sets the tone for the nation in passing legislation where the other 49 states end up drafting behind. This bill looks to drive up the cost of ownership and might be punitive for every rider while doing little or nothing to actually address the issue of excessive motorcycle sound. 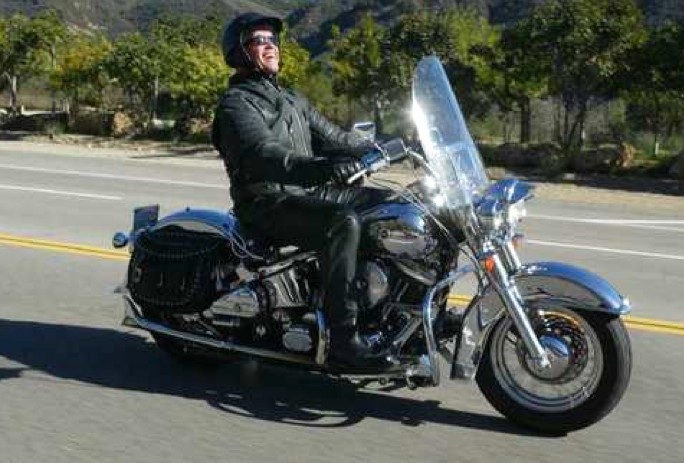 Governor Schwarzenegger owns multiple motorcycles, but most believe he will sign this bill into law. 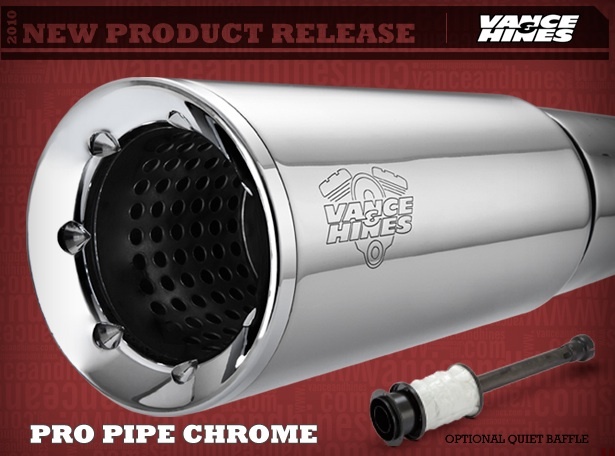 Photo courtesy of Vance & Hines.